One of the hardest things in art and design is getting perspective down. And while many organic things can be fudged to look fine, there are some times where a more precise and technical perspective must be used. 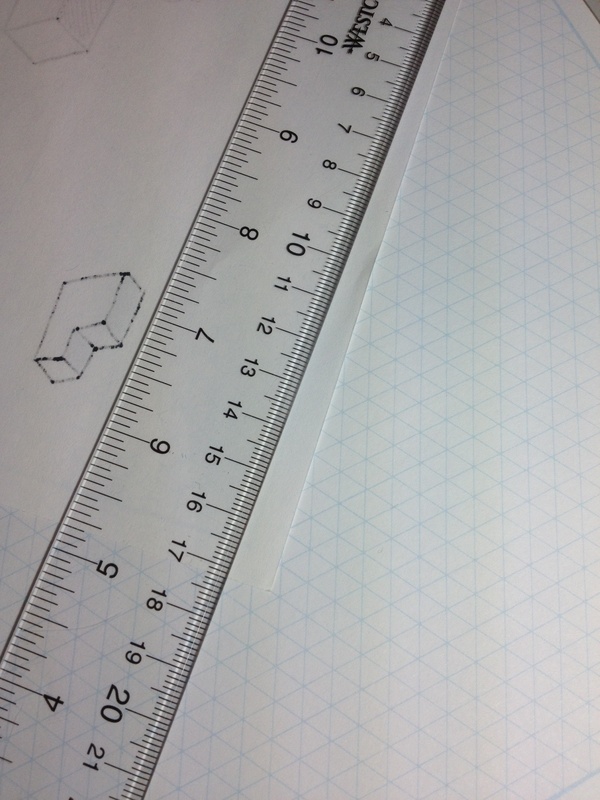 That’s where isometric graph paper comes in (at least for 2-point perspective), with rulings that serve as guides for simple-but-precise shapes rotated at 45 degrees (or hexes). The particular brand I’m looking at today is Alvin. The paper comes in a pad of 30 sheets with a cardboard back and cardstock cover. The “spine” is simply glue that allows pages to be easily torn off. The paper itself is a pretty standard 20 lb weight that resists bleed-though on ballpoints and smaller felt tips. Rollerballs, larger felt tips, Sharpies, and the like will bleed, but not terribly. Show through is pretty bad, and the second side has no graph so I can’t recommend the back for use. The graph has a ¼ to ½ inch border around the edge with some basic information printed on it. The graph is just under 10 ½ inches by 8 ¾ inches, with lines coming from the border at 30, 90, and 120 degrees every quarter inch. The lines are a light blue and will not show up on simple scanner, and very faintly on more modern scanners when set to greyscale. Still, they can be easily removed and don’t photocopy well, meaning the drawing or diagram can stand on its own. The grid is very helpful in creating simple outlines for 3D shapes and places, or hexes for board games and tile patterns. The paper is pretty unspectacular but it’ll get the job done. I have no clue about its archival properties, but since they aren’t advertised I’d say they’re minimal at best. They’re a fun thing to mess around with and a useful classroom tool, but they might be left behind for more serious art and design. 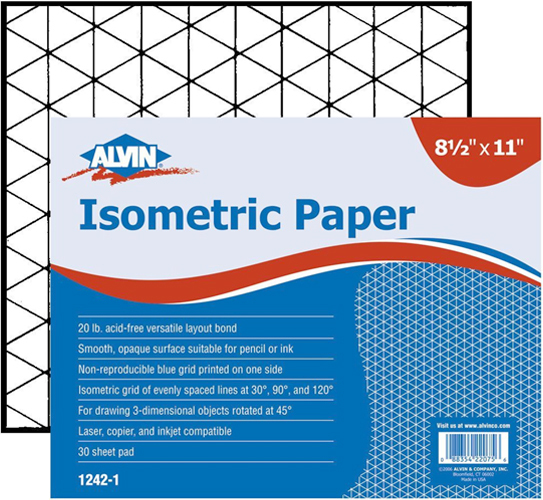 This entry was posted in Consumables, Intermediate Supplies, Surfaces and tagged 20lb, 3D, alvin, alvin isometric paper, art supplies, art supply, art supply critic, classroom, critics, drafting, drawings, etc, hexes, isometeric, isometric drawing paper, review by Dragon Co (Austin Smith). Bookmark the permalink.